There is a secret for staying well that is within your body’s own nature. Have you ever wondered why there are some people that you meet and it seems like you never see them get sick. You find yourself getting sick from time to time catching a cold virus and going thru a miserable time for a week or two, but they don’t seem to ever go thru that same type of misery. Is it just good luck on their part or is there something else more there that is going on at a different level? Well, if you are a student at the School of Chi Energy, you find out the reasons why situations like that can occur. Students at the school learn how their own body’s make these specific natural killer cells (NK cells) that can rid your body of a virus, by using a protein to do so. In fact, It is our body’s last line of defense against a viral attack. 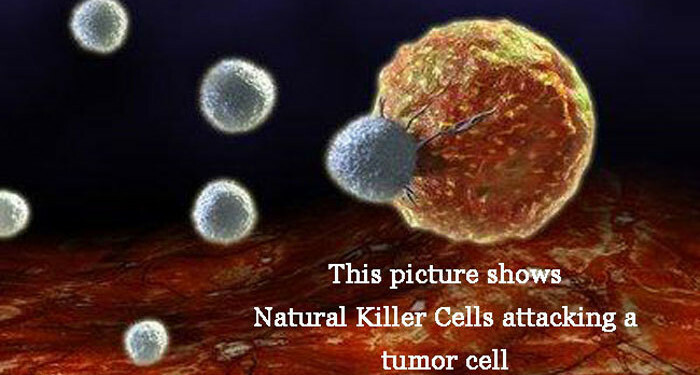 The amazing thing about these magical cells is their ability to heal your body, when none of the other body’s defenses can; but the funny thing about NK Cells is their ability to disappear should your body go into a depressed or sad mood. It turns out these NK Cells only come out when you are in a good mood and tend to completely disappear when a person becomes depressed or sad. It turns out, those people that don’t seem to get sick are the same ones that tend to be happy all the time too. Laughter it seems is the best medicine just like the Reader’s Digest magazine would tell us it was. One of the main reasons a virus is so hard to fight is because it really isn’t alive in the true sense of the word. A virus cannot divide or multiple by itself, it uses your own body’s cells thru mitosis in order to do that. Every time your own body makes new cells and divides a cell with a virus in it, it is causing more viruses to come into existence. It turns out that our NK Cells can seek out these problem cells with a virus and get rid of them. These NK Cells store up in different parts of the body, as well as stay in service in your bloodstream in order to keep you healthy. In our school, we show students where these areas are and how they can make them stronger and in better shape. Students learn that making good electrical connections with the body’s nerve fiber system can help their bodies heal faster. Students can easily catch the direct cause & effect of being able to stay healthier for longer periods of time. If you are finding yourself getting sick more than once a year (even with allergies), than maybe it’s time for you to make a change and see how easily you can go to being that person that isn’t getting sick. We get regular testimonies from students that tell us that very thing. They use to get sick on a regular basis and now they don’t. The difference being, that now they are performing a simple low aerobic impact energy exercise each day to ensure their body is running at its best. Students that combine our Tri-concept of making things feel good & cool while performing the energy exercises get even better results. So, if you are tired of being sick & tired, then maybe our school will work for you. We don’t teach magic in the school, but we do teach students tried & true chi techniques that will radically change their life for the better. Please visit our The School of Chi Energy for more information. Thanks.